Leaving for Austria and Germany today, I've been considering my goals for this trip. Certainly I'm looking forward to visiting the vineyards, wineries and homes of some winegrower friends who I've known for years but never had the chance to spend time with on their home turf. That will be great! But, I'm also an avid sponge of world cultures and hope to gain a strong appreciation of regional distinctions and quirks. I'm sure I'll eat too much! The wine will be abundant, that's for sure. Traveling with friends will be neat. Charlie Deal (chef/owner of Jujube, Dos Perros), Bill Bowman (former co-worker from my Fowler's days and now an importer/distributor) and Ryan Fulkerson (a friendly sales rep and overall good guy) will make this a fun and dynamic trip. These guys are pros, but they also know how to cut loose and have a good time. Plus they're all fun & funny. I'm looking forward to the laughs. It's also a great opportunity to document a little slice of my life that I can share with family, friends and the community that has developed in and around our store. Looking past this trip, it will be neat to look back and laugh and remember. Yum! 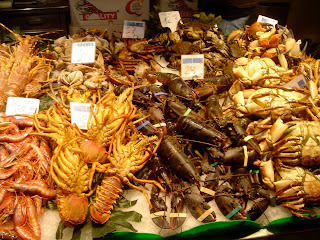 Shellfish display from a previous trip to Barcelona. Of course the primary goal is to find new wines and taste new vintages of wines I already know. Wine education is an important part of my life, so getting my fingers in the dirt and being exposed to the "terroir" will greatly help my understanding of why these wines are what they are. I also want to give our customers following this trip online a taste of the adventure. One of Wine Authorities objectives for 2010 is to expose our customers to the potential adventure that can be found in the world of wine on the shelf just down the street from their house. Much goes into that tasty liquid living in a bottle that you bring home tonight. What you uncork and pour into your glass can either be a beverage that packs a little buzz, or it can be the latest chapter in a family's long history that speaks of their deep cultural roots and tells tales of that year's weather and the craft of the artisan who made it. Is it something you drink for comfort, or something you've never had before that opens a door to the unknown when you pull the cork? The Century Club has several of our customers considering that adventure, and I'll surely let you know the many obscure grapes that I hope to check off of my list. Check back, I'll do my best to keep this interesting and entertaining! Have a safe and wonderful journey! Just curious, as this is my main trouble with hand taken notes in that I can't decide any logic. But then I don't ever have a computer handy to put them in a database.